EOS 7D Mark II, EOS 5DS and EOS 5DS R users who have longed for a quick and simple way to add Wi-Fi capability to their cameras, rejoice! Canon is introducing a new and affordable way to enable wireless connectivity to compatible mobile devices, and even communicate with Windows® or Mac® computers — the Wi-Fi Adapter W-E1. This wireless adapter is going to open up new possibilities to users of these cameras — from casual shooters to working professionals. Being able to quickly view and store your DSLR images on a mobile device makes it easier to share images you’ve just taken with family members, friends, or even professional clients. This device will be available separately as an optional accessory for owners of any of the above-mentioned EOS camera models. 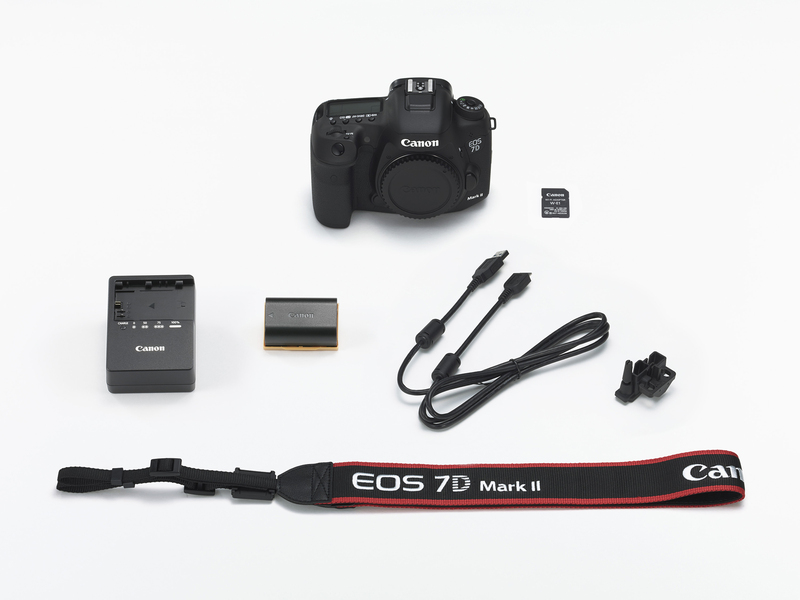 And from Fall 2016 onward, the EOS 7D Mark II will be sold with this Wi-Fi Adapter included in the box. We’ll go into detail about that below. First, some basics about this new Wi-Fi unit. Wi-Fi connectivity is built-in to many recent Canon EOS camera models, but not into these three cameras. Until now, users who wanted a Canon device to allow Wi-Fi connectivity with those models were limited to the professional Canon Wireless File Transmitter WFT-E7 (known as the “E7A” in the North American marketplace). This is an add-on accessory, which attaches to the bottom of the camera. No question that it adds professional-level Wi-Fi performance and features, starting with its ability to send wireless signals up to almost 500 feet (150m) from the camera. But this is a relatively costly device for individual photographers who aren’t working for news organizations, or who aren’t dedicated, full-time studio professionals. And, its size and shape are hardly ergonomic for users needing portability on-location. Canon engineers heard the call for a new Wi-Fi option, and the Wi-Fi Adapter W-E1 is their answer. Canon’s new Wi-Fi Adapter W-E1 is the size and format of a typical SD memory card. But unlike normal SD cards, this contains only the wireless communication hardware necessary for image transfers to mobile devices and computers. The card itself cannot store image files — these must be saved to a CompactFlash card instead. The Canon Wi-Fi Adapter W-E1 is designed for lightweight and easy wireless communication at up to about 32 feet (10 meters) from the camera, under clear Wi-Fi conditions. Because of its incredibly compact size — again, the entire device is the size and form factor of an SD memory card — there are some common Wi-Fi features that could not be included. Excluded features: the ability to transfer images from one camera to another; the ability to send image files to a Wi-Fi-enabled printer; the ability to view images on a compatible media player; the ability to directly send images to web services (your e-mail, social media pages, etc. ); the ability to record video using a smartphone; and the ability to operate the optional Power Zoom Adapter PZ-E1 via a smartphone. 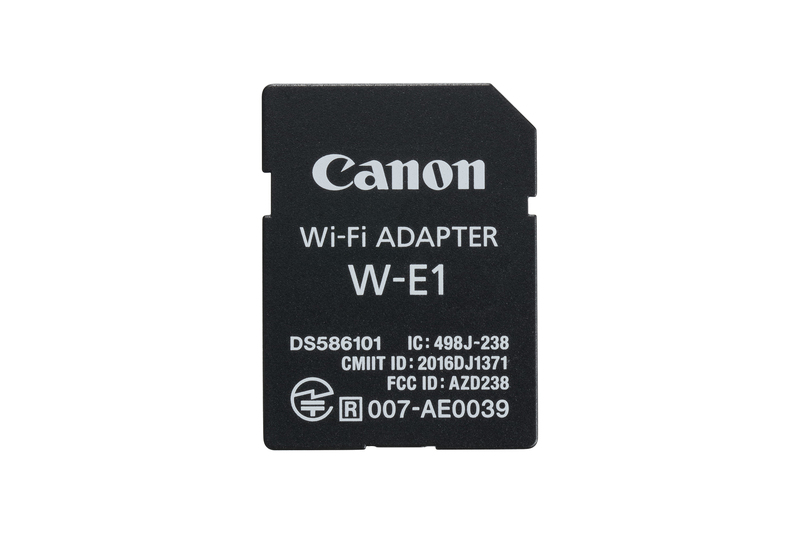 Furthermore, unlike some Wi-Fi-enabled Canon EOS cameras, the Wi-Fi Adapter W-E1 cannot connect to external devices using NFC technology. 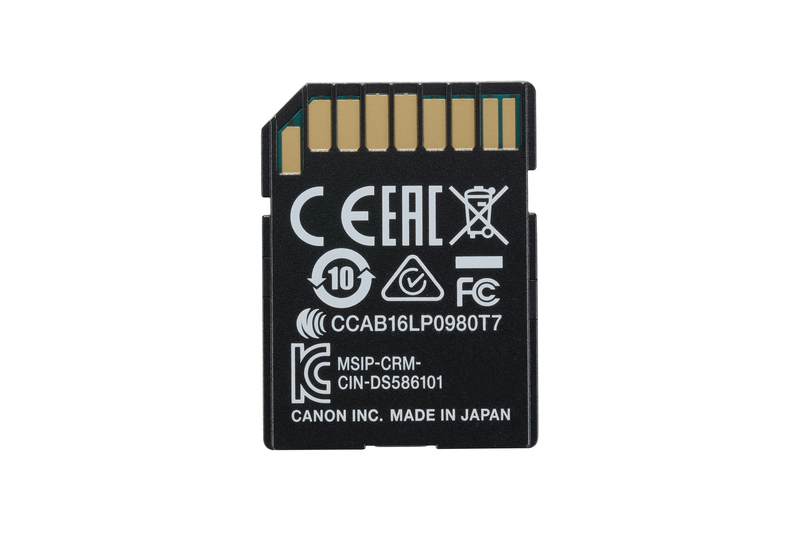 This Wi-Fi adapter must be installed into the SD card slot of the host camera — again, an EOS 7D Mark II, EOS 5DS, or 5DS R. These are the only Canon EOS cameras, as of the introduction of the W-E1, that will be compatible. A very important note: the W-E1 card cannot store image files at all. It solely contains the hardware to perform wireless connection to compatible external devices. Therefore, if the W-E1 card is installed, a CompactFlash memory card must also be installed in the host camera, and this will be the card to which images are stored. There is no work-around to this. If the W-E1 alone is installed, an error message will be displayed on the camera’s LCD monitor, informing the user that an incompatible card for storing images is installed. A rear view of the Wi-Fi Adapter W-E1. This accessory card will add wireless communication features to EOS 7D Mark II, EOS 5DS, and EOS 5DS R cameras, once a firmware upgrade has been installed in the host camera. Once the appropriate firmware is installed in the camera, users will be able to activate the wireless features with a new entry in the camera’s Set-up Menu. Wireless communication with an external device requires that the device has the appropriate Canon software installed. iOS and Android™ smartphones, tablets, etc. The W-E1 is only able to transmit JPEG still image files wirelessly. If you shoot RAW images in-camera, and then select one (or more) and send them via the W-E1, they are reduced to 1920x1280 JPEG files, which are then sent to your mobile device. Thus, there is no special need to deliberately shoot RAW + JPEG original files. Similarly, there’s no need to rely on user-applied, in-camera RAW processing (to create a JPEG copy image on the CF card), unless you wanted to apply some sort of RAW correction — such as changing a white balance setting, lightening or darkening, switching to a different Picture Style, and so on. Also note that video recording must be completely stopped, and the camera switched out of video recording mode altogether, before Wi-Fi communication with mobile devices can be performed. What video users can do with the W-E1 is browse video files (along with any still images on their camera’s installed CF card), and transfer MP4 video files to a mobile device or computer. Larger .MOV files (including any recorded in the camera’s “ALL-I” settings) cannot be wirelessly sent to an external device, because of their size. As we hinted at the start of this article, beginning in Fall 2016, new EOS 7D Mark II cameras will roll out of Canon’s factory with W-E1 cards packed in the box — giving the camera, in effect, Wi-Fi capability from the time you receive it. Moving forward, this will be the only way EOS 7D Mark IIs will be sold in most markets around the world. Beginning in late 2016, new EOS 7D Mark II cameras will be sold with the Wi-Fi Adapter W-E1 included in the box. Both body only, and body with the Nano USM version of the EF-S 18–135mm standard zoom lens will ship this way. This new standard zoom kit for EOS 7D Mark II includes the super-fast Nano USM version of the popular 18–135mm lens, along with the W-E1 card, and all other peripheral accessories. The EOS 5DS and 5DS R will continue to be sold without the Wi-Fi Adapter W-E1. However, the wireless adapter card can be added as a separate accessory at any time. It will be available through Canon USA’s on-line store, as well as at authorized Canon dealers. 2412 to 2462 MHZ; 1 to 11 ch. The Wi-Fi Adapter W-E1 is likely to be a welcome accessory for users of these upper-end Canon EOS cameras. With virtually no added footprint, and a relatively modest cost, the W-E1 card transforms the camera into one that now has Wi-Fi capability, suddenly making your mobile device an extension of your camera. And for users who like to work in a slower, more deliberate fashion, the ability to do what amounts to wireless tethered operation to a laptop or studio computer can really ease your workflow. Finally, think of its remote control capabilities — as long as you remain relatively close to the camera, you can shoot still images and even change major camera settings from your smartphone or tablet, viewing through the camera’s lens on your device’s screen. Few accessories have potentially offered so much, and with so little impact on the camera or the photographer’s wallet. We urge EOS 5DS, 5DS R, and 7D Mark II users to seriously consider adding one of these new adapters to their camera bag.